Who doesn't love a warm, gooey, fudgy (or cakey), chocolate brownie? These little squares of heaven that satisfy any sweet tooth are universally loved. But, what are they exactly? Are they bars, cookies, or cakes? 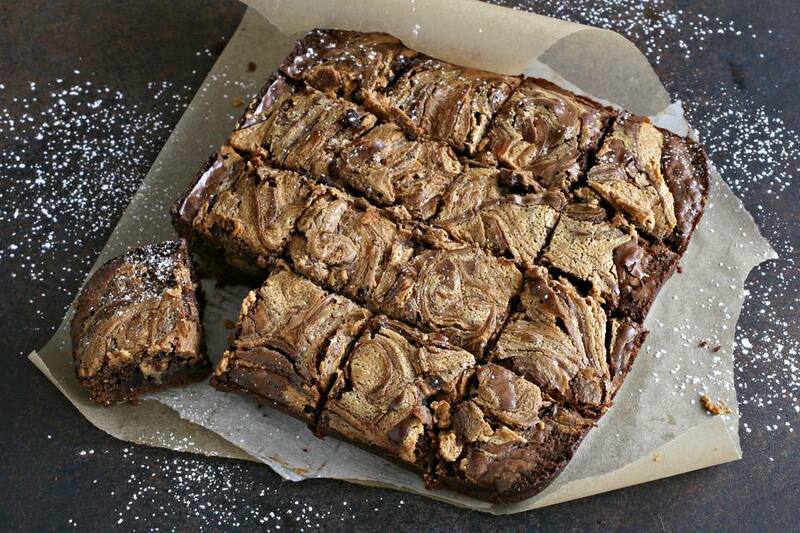 Brownies are in fact a form of cake, and have been around since the end of the 19th century. Brownie batter can include nuts of all kinds or chocolate chips and the tops can be frosted or left plain. One of our favorite kinds are brownies that feature the dreamy marriage of chocolate and peanut butter. To keep the peanut butter from melting into the chocolate batter, it's made into its own dough, and swirled in to create an amazing flavor and pretty swirled effect on top. You can eat them straight from the pan, as a snack with a glass of cold milk, or as dessert packed into a lunch bag. For a fancier presentation, plate them and top with whipped cream, powdered sugar, or a scoop of vanilla ice cream. You can even pour some extra chocolate sauce on top and make it a sundae. Pre-heat the oven to 325 degrees F and butter and flour an 8" square baking pan. Add the butter and chocolate to a heat-proof bowl and set it over a pot of simmering water. Stir until melted and allow to cool slightly. Whisk the granulated sugar into the butter and chocolate mixture, then whisk in the eggs and vanilla. Sift together the all-purpose flour, baking powder and salt and stir into the chocolate batter. Make the peanut butter swirl filling by stirring together the melted butter, confectioners sugar, peanut butter and salt until smooth. Pour the chocolate batter into the prepared pan and spread out evenly. Drop tablespoons of peanut butter filling on top of the batter and use a butter knife or a long skewer to gently swirl the peanut butter filling into the batter. Do not mix all the way so that the pretty swirl pattern remains on top. Bake for about 35 to 40 minutes, or until a toothpick comes out clean. Let cool and cut into 9 squares. Note that you can add a cup of chocolate chips or peanut butter chips to the batter before baking, if you like.